Made to accompany his new book, How's Your Soul? is new way of looking at wholeness and identity in the modern age. The term soul is notoriously hard to define. After all, how can we quantify and categorize something that is invisible, subjective, and untestable? We can't see our soul, so we tend to have trouble describing it, much less actively caring for it. And yet, on some level, we are always aware of our soul. We continually monitor whether we are experiencing peace or anxiety, joy or desperation, fulfillment or emptiness. As believers in Christ, we often assume that because we are saved, forgiven, and accepted by God, the "inside us" is taken care of. But is it really well with our souls? Is the inside us as steady and stable and secure as we would like to think? Our souls can only be healthy when they are at home in God: that is, when they return to God, when they find their purpose in God, and when they return to relationship with God. So, is that true in our lives? 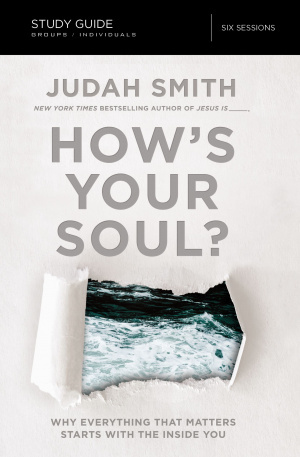 In How's Your Soul, a six-session video-based study, bestselling author Judah Smith explores the nature of the soul and how we can care for it. He reveals how our souls all have an innate longing that only God can fulfill and how we find our identity in Christ. He also shows how our lives will change when we focus on heaven, our eternal home, instead of this world. How's Your Soul? Study Guide by Judah Smith was published by Thomas Nelson in December 2016 and is our 29423rd best seller. The ISBN for How's Your Soul? Study Guide is 9780310083863. Be the first to review How's Your Soul? Study Guide! Got a question? No problem! Just click here to ask us about How's Your Soul? Study Guide.